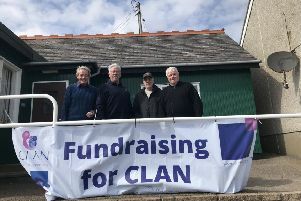 Katherine Lawrie from Stonehaven is to row for Robert Gordon University in the 23rd annual Aberdeen Boat Race, which takes place on Saturday, March 17. Following months of trials and tests, the final crews were announced last Sunday, and 20-year-old Katherine was one of nine selected for RGU. She is one of five survivors from last year’s RGU crew, which lost to Aberdeen University. Katherine has been rowing for 12 years and competed for Scotland in the junior fours and eights in the Home International Regatta at Strathclyde Park in 2015, finishing second and third respectively. The total of 18 students were selected by president of Robert Gordon University Boat Club Erin Wyness and Henry Pettinger-Harte, president of the Aberdeen University Boat Club, who have been assessing each rower on their technical skill and performance during races since the academic year began in September. Both Erin and Henry have assembled their perfect crews, singling out the best local talent as well as enlisting experienced rowers from around the world. The two crews will battle it out over a 3.5km course on the River Dee, in a race sponsored by Aberdeen Standard Investments. Martin Gilbert, co-chief executive of Aberdeen Standard Investments, said: “The Aberdeen Boat Race allows both the University of Aberdeen and Robert Gordon University to showcase some of their finest student athletes in a competition that – every year – gets closer and closer. The University of Aberdeen claimed the first clean sweep in the event’s history last year, winning the Aberdeen Boat Race in 7min 3.4sec, along a course shortened due to weather conditions, and also triumphing in the alumni and second crew races. The course record is 7min 38.6sec, set by Robert Gordon in 2016.